Rate this project Tomasz Jokiel has announced the release of Porteus Kiosk 4.7.0, the latest stable build of the project's specialist Gentoo-based distribution designed for web kiosks (with Firefox and Chrome browsers): "I'm pleased to announce that Porteus Kiosk 4.7.0 is now available for download. Major software upgrades in this release include: Linux kernel 4.14.50, Mozilla Firefox 52.8.1 ESR and Google Chrome 66.0.3359.181. Packages from the userland are upgraded to portage snapshot tagged on 20180616. The latest kiosk release brings more work on mitigitng the Spectre vulnerabilities through updated CPU microcode and kernel patches. The newly discovered 'Spectre Next Generation' vulnerabilities require updated microcode from Intel which is not available yet. Please consider enabling automatic updates service for your kiosks to receive latest fixes and patches as soon as they become available. Short changelog for 4.7.0 release: it's now possible to explicitly set the shutdown options which should be present in the kiosk shutdown menu; added support for refreshing browser webpage with defined time interval...." See the release announcement and changelog for more information. Download (MD5): Porteus-Kiosk-4.7.0-x86_64.iso (87.0MB, pkglist), Porteus-Kiosk-Cloud-4.7.0-x86_64.iso (87.0MB), Porteus-Kiosk-Server-4.7.0-x86_64.iso (89.0MB), Porteus-Kiosk-ThinClient-4.7.0-x86_64.iso (105MB). Tomasz Jokiel has announced the release of Porteus Kiosk 4.8.0, an updated version of the project's specialist distribution designed for web kiosks - based on Gentoo Linux, with a choice of Firefox or Chrome browsers: "I am pleased to announce that Porteus Kiosk 4.8.0 is now available for download. Major software upgrades in this release include: Linux kernel 4.19.16, X.Org Server 1.20.3, Google Chrome 70.0.3538.110 and Mozilla Firefox 52.9.0 ESR. Packages from the userland are upgraded to portage snapshot tagged on 2019-01-19. Short changelog: added support for the 'onscreen buttons' to the Firefox browser - back, forward, home, print, etc; it is possible to set default paper size for the printer directly in the kiosk configuration - 'A4' and 'Letter' sizes are available in the wizard by default but other ones are supported as well; added possibility of forcing the 'fbdev' DDX driver which in some cases - depending on the GPU card - offers higher screen resolution than the VESA driver; it is possible to set a custom port number on which the VNC service will be listening." See the release announcement and changelog for further details. Download (MD5, pkglist): Porteus-Kiosk-4.8.0-x86_64.iso (93.0MB), Porteus-Kiosk-Cloud-4.8.0-x86_64.iso (93.0MB), Porteus-Kiosk-Server-4.8.0-x86_64.iso (94.0MB), Porteus-Kiosk-ThinClient-4.8.0-x86_64.iso (112MB). Tomasz Jokiel has announced the release of Porteus Kiosk 4.6.0, a new update of the project's specialist Gentoo-based Linux distribution designed for web-only kiosks. This version is predominantly a security update: "I'm pleased to announce that Porteus Kiosk 4.6.0 is now available for download. Major software upgrades in this release include Linux kernel 4.14.13, Mozilla Firefox 52.5.3 ESR and Google Chrome 63.0.3239.132. Packages from the userland are upgraded to portage snapshot tagged on 20180114. This release fixes the Meltdown attack and partially mitigates the Spectre vulnerability through updated CPU microcode and on the application level. Firefox 52 ESR browser is less affected by Spectre while Chrome 63 needs experimental Site Isolation security feature enabled. More patches to be merged as Meltdown/Spectre bugs are still a work in progress. Please consider enabling automatic updates service for your kiosks to receive latest fixes and patches as soon as they become available." See the release announcement and changelog for further details. Download: Porteus-Kiosk-4.6.0-x86_64.iso (82.0MB, MD5, pkglist). Tomasz Jokiel has announced the availability of a new release of Porteus Kiosk, a Gentoo-based distribution used for exclusively running a web browser. The project's latest release, Porteus Kiosk 4.5.0, includes several package upgrades, including Linux 4.12, Firefox 52 ESR and Chrome 60. In addition, the distribution now supports configuring multiple touch screens connected to one computer. "Major software upgrades in this release include: Linux kernel 4.12.10, Mozilla Firefox 52.3.0 ESR and Google Chrome 60.0.3112.113. Packages from the userland are upgraded to portage snapshot tagged on 20170901. Short change log for 4.5.0 release: Added support for EAP over LAN (802.1x) authentication on wired connections. VNC and SSH daemons can be limited to listening on localhost interface. This is useful from security point of view as nobody can access the kiosk on public network interface. Mind that you'll have to use another service: Porteus Kiosk Server, Guacamole, NoVNC, etc in order to tunnel VNC or SSH traffic to kiosk's localhost interface. It is possible to calibrate multiple touchscreen devices which are connected to kiosk." Further information can be found in the project's release announcement. Download: Porteus-Kiosk-4.5.0-x86_64.iso (77MB, MD5, pkglist). Tomasz Jokiel has announced the release of Porteus Kiosk 4.4.0. Porteus Kiosk is a Gentoo-based distribution which has been customized to be a dedicated platform for exclusively running a web browser. The new release features Firefox 52 ESR, Google Chrome 58 (with Netflix streaming support) and the swap partition has been replaced by a more flexible swap file. "I'm pleased to announce that Porteus Kiosk 4.4.0 is now available for download. Major software upgrades in this release include: Linux kernel 4.9.30, Mozilla Firefox 52.1.2 ESR and Google Chrome 58.0.3029.110. Packages from the userland are upgraded to portage snapshot tagged on 20170526. Short changelog for 4.4.0 release: Online or local webpage can be used as the screensaver. Swap partition has been replaced with more flexible swap file. It is possible to set custom printer name in the system. Added support for hosting SSL certificates directly on Porteus Kiosk Server. Enabled CloudPrinting by default for Porteus Kiosk Cloud/ThinClient variants utilizing Chrome browser. All plugins for Chrome are enabled by default including 'Widevine Content Decryption Module' so its possible to watch e.g. Netfilx movies." A complete list of changes can be found on the project's news page. Download: Porteus-Kiosk-4.4.0-x86_64.iso (72MB, MD5, pkglist). Tomasz Jokiel has announced the availability of a new version of Porteus Kiosk, a lightweight Gentoo-based Linux operating system which has been downscaled and confined to allow the use of one application only - a web browser. The new release, Porteus Kiosk 4.3.0, features Firefox 45 ESR, Google Chrome 55, Adobe Flash 24 and version 4.9.14 of the Linux kernel. "I'm pleased to announce that Porteus Kiosk 4.3.0 is now available for download. Major software upgrades in this release include: Linux kernel 4.9.14, X.Org Server 1.19.2 Mozilla Firefox 45.8.0 ESR, Adobe Flash 24.0.0.221 and Google Chrome 55.0.2883.87. Packages from the userland are upgraded to portage snapshot tagged on 20170311. Short changelog for 4.3.0 release: Configuration parameter 'client_id=automatic' will automatically assign client ID to the kiosk - no need for manual configuration per device. This parameter makes client installation easier and faster especially for large deployments. Serial backend for the CUPS printing service has been enabled by default. Some USB printers still require it for direct USB connection." Further details can be found on the project's news page. Download: Porteus-Kiosk-4.3.0-x86_64.iso (67.0MB, MD5, pkglist). Tomasz Jokiel has announced the release of Porteus Kiosk 4.2.0. The Gentoo-based kiosk platform now provides version 4.4.36 of the Linux kernel, Firefox 45.5.1 ESR and Google Chrome 54, along with many other changes. 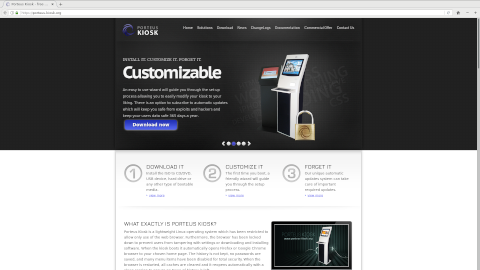 "I'm pleased to announce that Porteus Kiosk 4.2.0 is now available for download. Major software upgrades in this release include: Linux kernel 4.4.36, X.Org Server 1.18.4, Mozilla Firefox 45.5.1 ESR and Google Chrome 54.0.2840.100. Packages from the userland are upgraded to portage snapshot tagged on 20161203. Short changelog for 4.2.0 release: All files used by the clients (wallpaper, screensaver slide show images, browser preferences, proxy configuration) can be hosted directly on Porteus Kiosk Server - no need to use 3rd party web hosting service anymore. If multiple browser tabs were set during installation then it's possible to toggle between the tabs at specific time interval. This is useful for digital signage purposes. 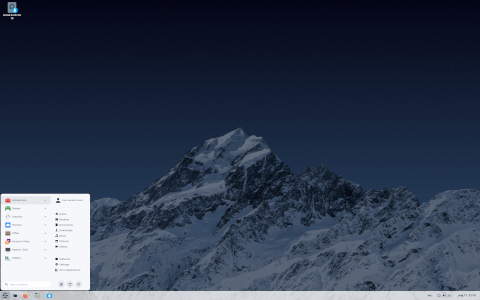 Screensaver slideshow can display images in random order instead of alphabetic order...." Further details can be found in the release announcement. Download (pkglist): Porteus-Kiosk-4.2.0-x86_64.iso (62MB, MD5), Porteus-Kiosk-Server-4.2.0-x86_64.iso (63MB, MD5). Tomasz Jokiel has announced the release of Porteus Kiosk 4.1.0, a new version of the project's Gentoo-based distribution for web kiosks: "I'm pleased to announce that Porteus Kiosk 4.1.0 is now available for download. Linux kernel has been updated to version 4.4.19, Mozilla Firefox to version 45.3.0ESR and Google Chrome to version 52.0.2743.116. Packages from the userland are upgraded to the Portage snapshot tagged on 2016-09-03. The new release brings two new spins of Porteus Kiosk system - a Cloud variant and a ThinClient variant. The Cloud variant provides an easy access to the web applications and services, such as Google Apps for Education, Jolicloud, OwnCloud or Dropbox. It is less restrictive than the Kiosk variant as it offers functionality which cannot be easily implemented in the standard Kiosk image." See the release announcement and changelog for more details. Download (MD5): Porteus-Kiosk-4.1.0-x86_64.iso (61.0MB, pkglist), Porteus-Kiosk-Cloud-4.1.0-x86_64.iso (61.0MB), Porteus-Kiosk-Server-4.1.0-x86_64.iso (62.0MB), Porteus-Kiosk-ThinClient-4.1.0-x86_64.iso (81.0MB). Tomasz Jokiel has announced the release of Porteus Kiosk 4.0.0, a major new release of the project's Gentoo-based distribution of Linux designed for web kiosks. The biggest change is a switch to the x86_64 architecture following Google's decision to drop support for the 32-bit Chrome browser on the Linux platform: "I'm pleased to announce that Porteus Kiosk 4.0.0 is now available for download. The Linux kernel has been updated to version 4.4.11, Mozilla Firefox to version 45.1.1 ESR and Google Chrome to version 50.0.2661.102. Packages from the userland are upgraded to the Portage snapshot tagged on 20160528. Here is an overview of the most notable features introduced in this release: added support for setting default microphone in case you have multiple capture devices in the system; it's now possible to download screensaver slideshow ZIP archive every X minutes; import certificates function has been extended to also support Citrix Receiver certificates...." Read the release announcement and the changelog for further information. Download (MD5): Porteus-Kiosk-4.0.0-x86_64.iso (58.0MB, pkglist), Porteus-Kiosk-Server-4.0.0-x86_64.iso (60.0MB).